Q: How soon do we need to reserve our restroom trailer? A: As I’m sure you have found out, there are about 15 weekends during the summer and fall that are the most popular for outdoor events. Our restroom trailers are perfect for an outdoor wedding, so they are the first to go. If your event is on one of the weekends listed below, we would recommend reaching out immediately even if you’re not ready to send in your 50% deposit. 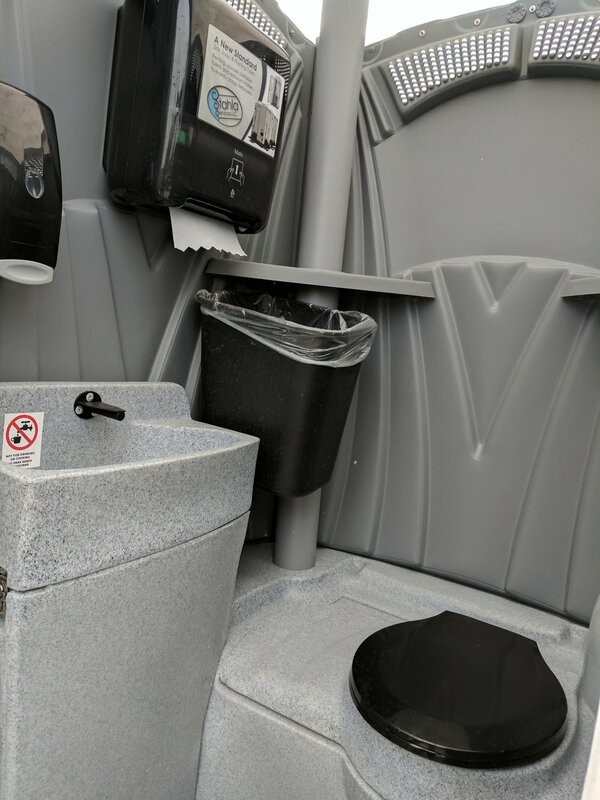 If you reach out and let us know you’re probably going to rent a restroom trailer we will do our best to keep a restroom trailer available or let you know as soon as we are fully booked for that weekend. Q: When will you deliver and pick up our luxury Restroom trailer? A: Most of our events are Friday evening, Saturday or Sunday. We usually deliver Thursday or Friday and pick up on Sunday or Monday for those events. We can adapt to any schedule though, so if you have a unique situation we would love to work with you. Q: do restroom trailers need access to water and electricity? A: Restroom trailers require (one) 110 Volt, 20 Amp electrical connection and (one) connection to an outdoor water spigot during non-freezing temperatures. If temperatures are below freezing, we will need (three) 110 Volt, 20 Amp electrical connections. We provide the electrical cord (up to 300 feet) and hose (up to 400 feet). If you don’t have one or both, we can provide a quiet generator ($150 for the Two Stalls and Four Stalls; $200 for the 8 Stations) and bring water to fill the restroom trailer’s internal water tank ($100). Q: How do we reserve a restroom trailer or flushing portable toilet? A: Fill out the "Quote or Reservation" form and choose the option to "Reserve a Restroom." If you haven't received pricing, you can choose the option to "Request a Quote" and we will provide specific pricing. All we need to confirm the reservation is for you to reply to the email letting us know you would like to go ahead with the reservation. To finalize the reservation, we need a check or electronic deposit for 50% of the total. The final 50% is paid within 14 days after the event (we will resend the invoice). do the flushing portable toilets need access to water and electricity? Our Flushing Portable Toilets do not need access to water or electricity. We bring water to you and fill the restroom's internal water tanks when we set it up. The sink and flushing portable toilet are opperated by two seperate foot pumps. The LED motion light is powered by batteries and does not need to be plugged in. Where can i have my flushing portable toilet placed? Flushing Portable Toilets need to be within 20 feet of a road or driveway and placed on a mostly flat surface. We bring moving carts to keep your surfaces in pristine shape during delivery and pick up. When we come to pick up your restroom rental, we will drive as near as possible and empty the restroom tank with our vacuum hose (20 feet long). Our trucks can be as heavy as 26,000 pounds and 13 feet tall. If you see a problem with delivery or pick up at your location, please let us know by email or phone and we will work with you to figure out a good solution. 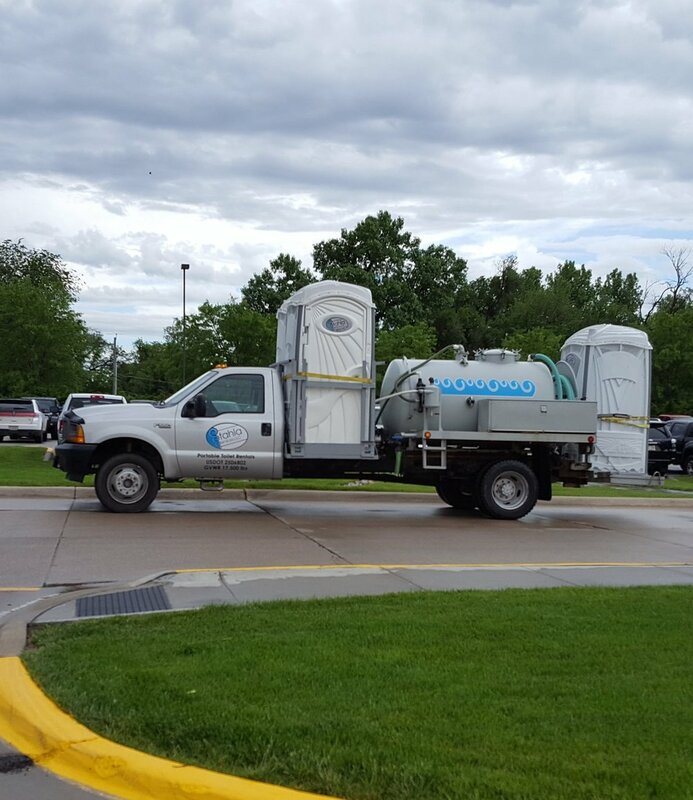 Q: When will you deliver and pick up our Flushing Portable Toilets? A: Most of our events are Friday evening, Saturday or Sunday. We deliver Friday and pick up on Monday for those events. We can adapt to any schedule though, so if you have a unique situation we would love to work with you. Keep in mind that we may have an additional weekend work rate if you need your flushing portable toilet delivered or picked up on Saturday or Sunday.